We had a great work day on Sunday 13th January with fifteen volunteers working up on Brighton Greenway, picking litter, cutting back the vegetation by the ‘tool’ fence overlooking Boston Street and cutting back on the Isetta strip. Our next work day is going to be SUNDAY 31st March. We’re not meeting in February – there’s likely to be maintenance work going on with scaffolding on the west wall. The broken down wooden fence on the east wall is also in the process of being repaired. The railings on the steps up the New England Embankment have already been replaced; with metal rather than wood, which is not as attractive, but this is likely to be more durable. Arrangements are also being made for the cycle track for pushing bikes up the embankment to be replaced. Do come along on March 31st – from midday until 3pm. Wear solid shoes and bring gardening gloves if you can. We’re a friendly bunch, so do come and join us for whatever time you can spare. And what will we be doing? The usual jobs of litter-picking, weeding, cutting back dead vegetation and … depending on the weather … maybe some planting or seed sowing. Our first work day of 2019 … today SUNDAY 13th January 12 – 3pm 2019. We’ll be on Brighton Greenway doing the usual maintenance things: litter picking, sweeping up leaves, cutting back overgrown vegetation and generally trying to give a bit of love and care to this urban pedestrian walkway. I’m not quite sure why we were invited to join the hosts of local TV station community spot ‘The People’s Republic of Brighton & Hove’, but on a very hot day back in August and under even hotter lights, I got interviewed about Brighton Greenway. It’s lovely to know there’s interest out there … and thanks to Andy Cheng for helping us publicise what we do. You can view the video here. It’s episode 42 – the first invitee was Ali from Queenspark talking about Active Archives (very interesting project, this maybe something people are interested in with relation to parks, greenspaces and the Loco Works). For the segment on Brighton Greenway, scroll through to minute 11. (I’ll try and get a more accurate click-though soon :). Growing wldflowers is not as easy as you think … when thistles, dock leaf and nettles decide to colonise your planting area. These are big brutish plants and while all of them have wildlife value, they’re not exactly er … eye-catching. 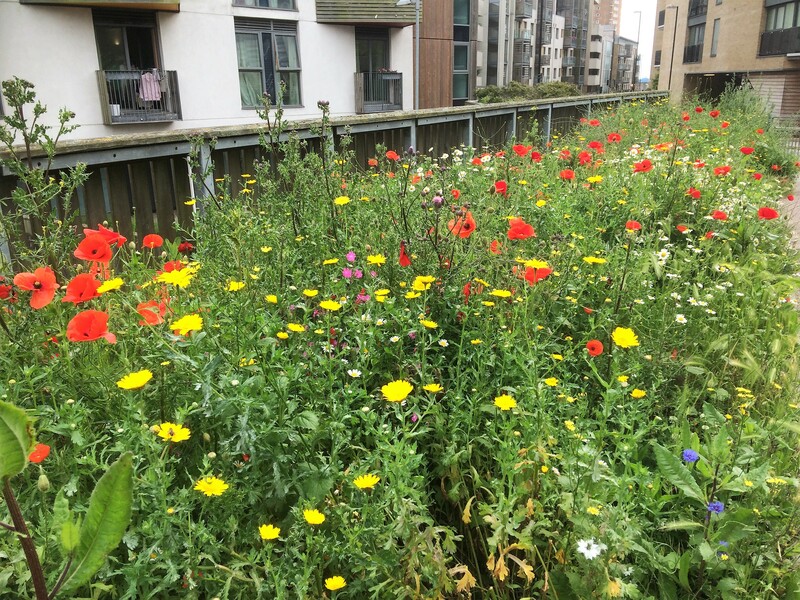 Back in 2016, we applied to the wonderful Grow Wild project for packs of wildflower seeds to bring some colour into Brighton Greenway. We sowed several packs along the strip above Isetta Square and in that wonderfully random mannner that seeds have a habit of adopting, some came up in 2016, some came up in 2017 (above) and some just didn’t. We had some packs of seeds left over, so in 2017, with the help of volunteers from Network Rail, we cleared a small but significant patch from thistles, dock, nettles, brambles and buddleja. It was hard physical work. We were able to rake the soil to a ‘fine tilth’ (the gardener’s dream) and sowed our seed. But then we did’t have much rain between April and June. We had some show from poppies, cornflowers and field marigolds but they were quickly trampled by thistles, dock, nettles and brambles. Dogs had also loved the ‘fine tilth’. 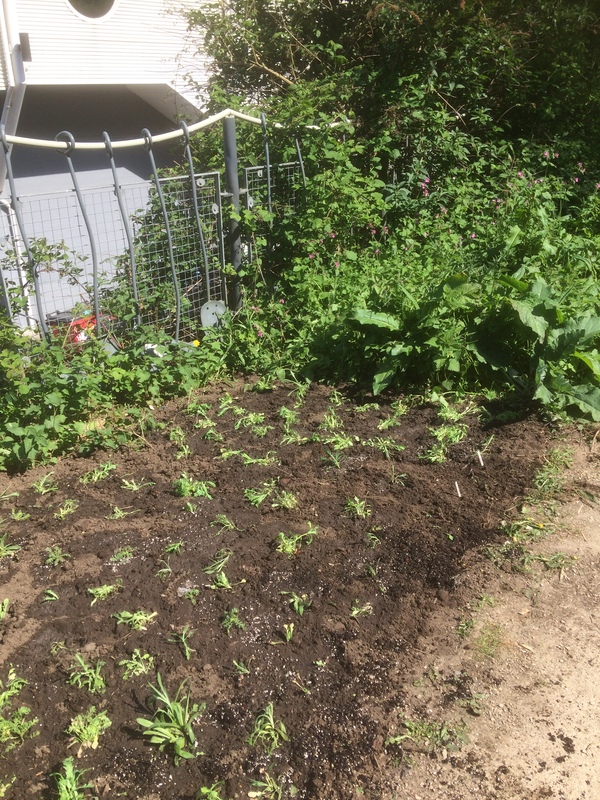 In 2018, with a few packs of seeds left, we decided to try the labour intensive approach to seeding: sow in compost in seed trays, cosseting in a greenhouse, careful transplanting and potting on of seedlings. We worked out this would be the only way the wildflowers would have a chance against the dogs, thistles, docks, nettles and brambles. 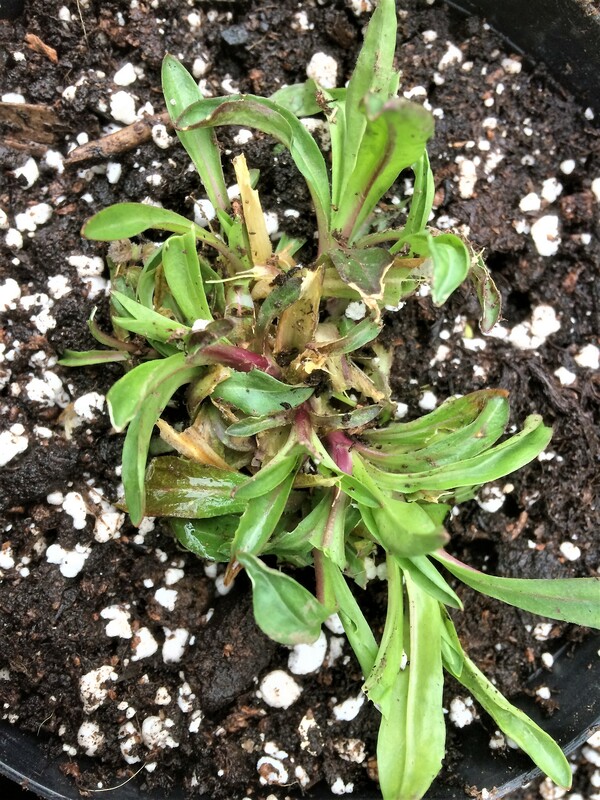 The seeds came up quickly in early March and survived our sudden very cold spells. 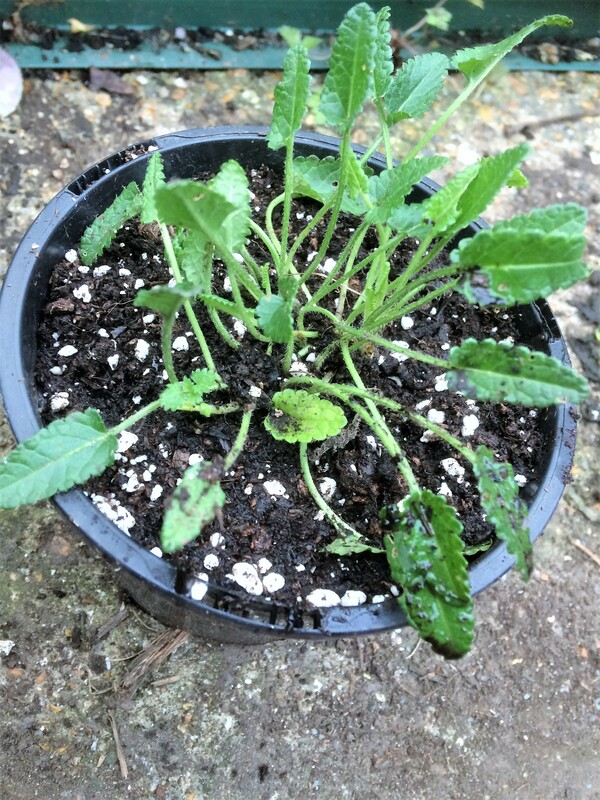 They grew on well in a cold frame in April. We worked again on clearing the perennial thugs and preparing the soil at our April work day and finally the seedlings were ready for planting out in early May. And then Brighton turned into the Mediterranean for June and much of July. We had little rain for three months. Everything grew very fast initially and then ran out of steam, parched, dried. Everything, that is, except the thistles, dock, nettles and brambles. By mid July, you could just about spot some bedraggled cornflowers, poppies and marigolds. Thankfully, someone had taken lovely photos back in early June when our little wildflower bed was at its best. Looking at them in August, as we yet again cut back thistles, dock, nettles and brambles, restored some optimism … Nature does what nature will, and I have faith that the plants from our Grow Wild seeds will have themselves seeded, and somewhere in the soil are the little time-bombs for colourful cornflowers, daisies, poppies and marigolds. 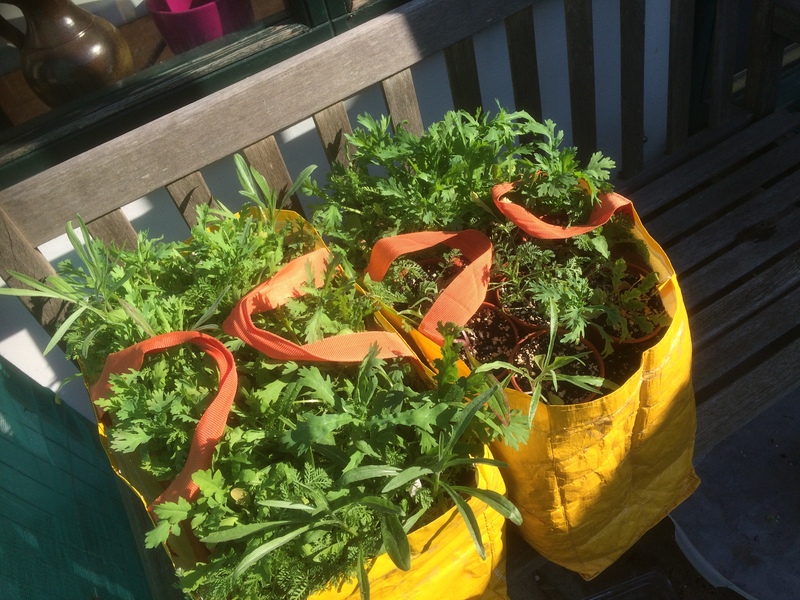 Next year, the year after … Meanwhile, we try various tactics to discourage the thistles, dock, nettles and brambles from taking over, but they are after all wildflowers too. It’s been an extraordinarily hot summer in Brighton with temperatures in June and July soaring to the high 20s and even over 30C. As I came down the New England Rd embankment steps today, a passer-by recognised the respite provided by the lush tree canopy. Several people were sitting out on the benches and Brighton Greenway felt … er … ‘green’ while in contrast, many of Brighton’s other ‘green’ spaces look brown and parched. We’ve had our problems trying to keep delicate wildflower seedlings going in the heat. It’s not been the best year for a sustained display of flowers, but look carefully and there is a wide range of flowers and now, seed-heads to observe. The Crimson Glory Vine climbing up the walls is a lush green and the hawthorns and buddleia are doing well. I also noticed that our Woodland Trust plantings from March 2017 are holding their own, despite the drought. 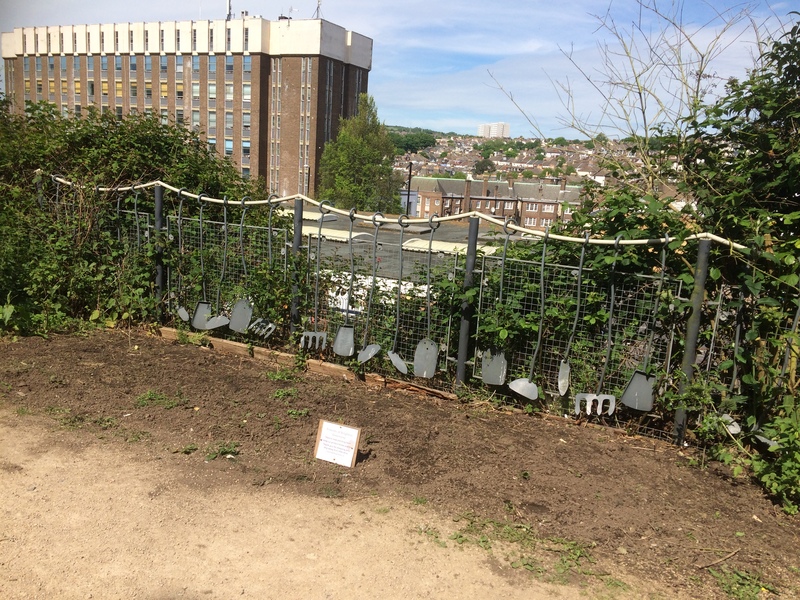 Back in early July, a bio-survey of invertebrates was undertaken on Brighton Greenway. There really is a lot of insect and bird life happening up there; little that is particularly rare, perhaps, but Brighton Greenway is serving to sustain ‘common’ wildlife which is becoming increasingly ‘uncommon’ in urban areas. Take a look (under our Wildlife pages) if only to marvel at the Latin names of all the ‘bugs’ that were spotted and delight in the fact that nine different types of butterfly were observed, including a beautiful ‘Peacock’ butterfly. We had a good work session yesterday despite unpredictable April weather: lots of rubbish clearance and quite a bit of planting and renewing of our ‘ornamental beds’ around the central seating area. The lavenders, rosemaries and Verbena bonariensis which we thought would tolerate the fairly tough conditions have succumbed to the cold and wet of the winter. We’ve been able to do some replanting, though. We inherited several trays of plants from the Council’s Stanmer Nurseries, which – very sadly – has closed. 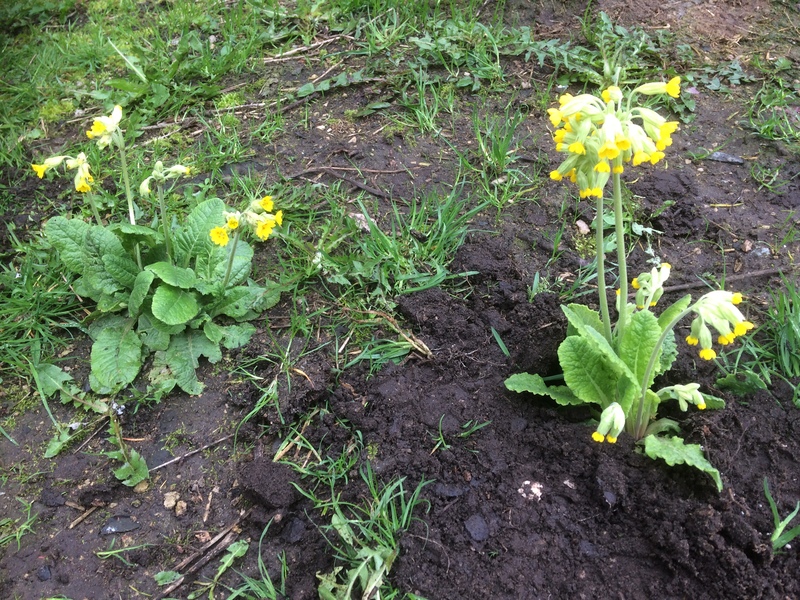 Among these were some beautiful cowslips (Primula vera) which we’ve planted underneath the birch trees at the Boston Street entrance to Brighton Greenway. 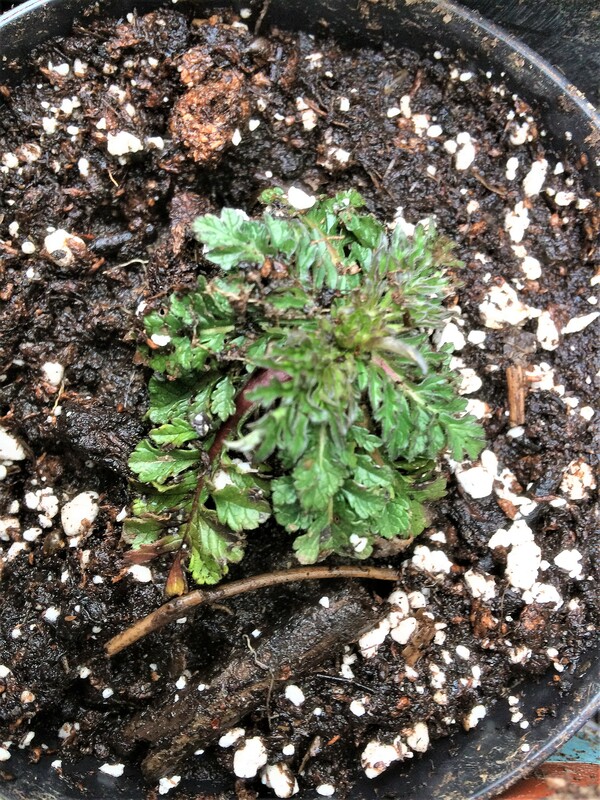 We also had other plants most of which we were unable to identify from their leaves. 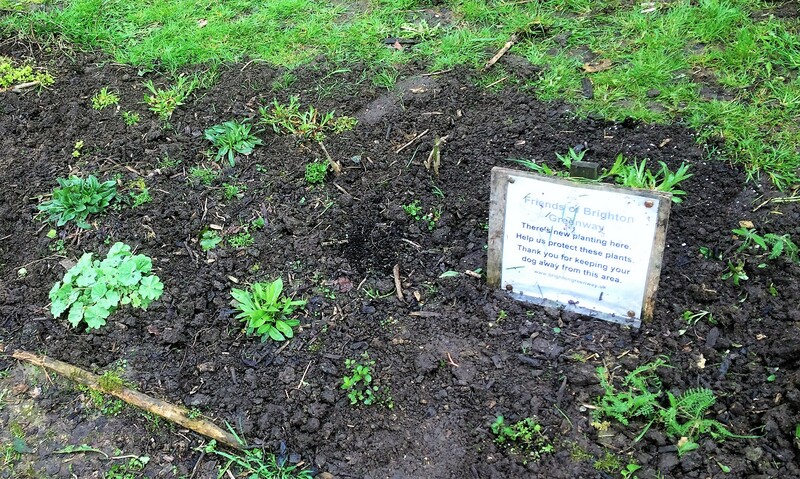 We think there was some wild marjarom (Origanum vulgare), some red campion (Silene dioica) and … well, we’ve planted everything in and around the central bench, so we’ll just have to wait for the summer to bring up the flowers and ease the identification task. Below are some of the plants: if you recognise them, let us know. Meanwhile, we’ve (well, Jon, single-handedly) cleared the nettles, dock leaves and thistles from the small area opposite the central seating. I now have to get this covered with black sheeting to stop these hugely successful plants from taking over again. We want to try planting wildflower seedlings here in May. 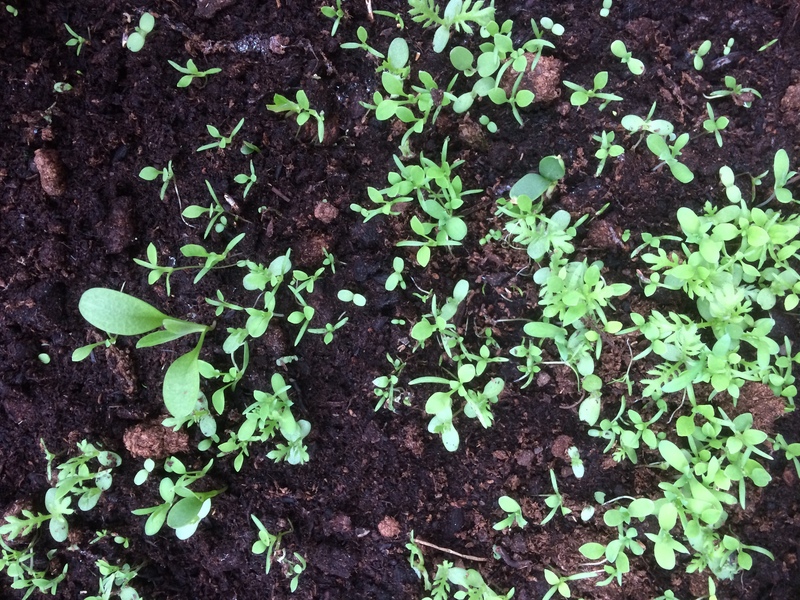 Back in March, I sowed some of our remaining seeds from GrowWild in trays. The seedlings are now ready for potting up – something of mammoth task for delicate fingers – and growing on ready for planting (and identification?) at our next session on May 6th. You can find our proposed dates for work days this year on our Work Day page.